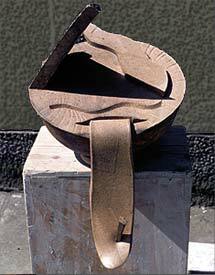 Left, middle, and far-right: 3 floor vases 42", Edinburgh College of Art, 1977. 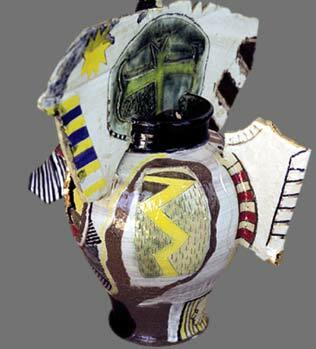 Above: "Winged Pot" 12.5" Halifax (Clayworks), 1989. Top (thumbnail): "Grief Violation" (part of the installation) 28", Halifax (The Photo Co-op), 1988. Above right and top-right (thumbnail): "Tongue" 20", ECA, 1976.